"The bear is loose!" President Obama has been saying, whenever he leaves the White House to visit Starbucks, or sandwich shops, or burger joints, or BBQ shacks, or neighborhood diners, in his increasingly rote and pathetic attempts to "connect" with "real people." Obama, we have been told, is frustrated, "restless," bored with the responsibilities and chores of office. He thinks of himself as the bear—intimidating, wild, untamed, roving—escaping his den. But he is flattering himself. Obama is not the bear. He is the cub: aimless, naïve, self-interested, self-indulgent, irresponsible, irresolute. The bear is in Moscow. One can trace a line from any global hotspot to Russia and its authoritarian ruler. Iran? Russia has assisted its nuclear program for decades. Syria? Russia is Bashar Assad’s arms dealer. Iraq? Russia is sending men and materiel to the central government. Afghanistan? Putin muscled nearby Kyrgyzstan into closing our air base there, crucial for transport, resupply, and reconnaissance in the war against the Taliban. The contretemps between the United States and Germany is the result of Edward Snowden’s breach of national security. Where is Snowden? In Russia, where he has just asked to have his visa renewed. I wonder if Vladimir Putin will say yes. Then there is Ukraine, where Putin has been driving events since March, when he illegally annexed Crimea. 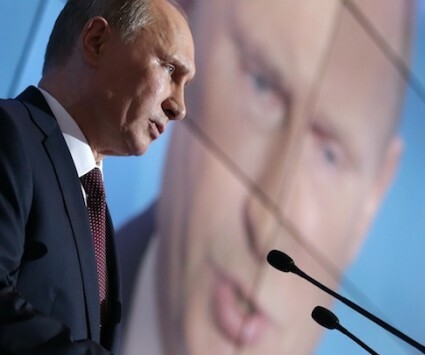 The West thought sanctions would intimidate Putin, would force him into retreat. For a time, he drew down his troops on the Ukrainian border, leaving the fighting in eastern Ukraine to separatists trained, armed, and led by Russian special forces. The West thought it could ignore the situation. A guerrilla war in the east, it was assumed, does not threaten democracy in Kiev. The Ukrainian economy returned to its lethargic equilibrium. The Ukrainians elected a president. President Obama, in his speech at West Point, trumpeted his Ukraine policy as an example of "our ability to shape world opinion" and "isolate Russia." Some isolation. Even as Western attention turned to the Middle East, Russia continued to act unimpeded, and the Ukrainian war went on. Recently, when Poroshenko, the new Ukrainian president, retook the city of Sloviansk, Putin’s hand was forced. Russian soldiers reappeared along the border—more than 10,000 at last count. The weapons systems supplied by Russia to the insurgents became more sophisticated. Earlier this week, a rocket brought down a Ukrainian cargo plane. The rocket was fired from Russia. Thursday brought us only the latest unintended consequence of Russia’s war on Ukrainian independence: the destruction of a Malaysian airlines flight carrying 295 souls. The attack is revolting, the loss of life infuriating, but the downing of Flight MH17 is not the first unanticipated outcome of the war Vladimir Putin began in Ukraine. Nor will it be the last. "I think it was a brilliant stroke," Hillary Clinton says of the "reset" policy the United States pursued toward Russia when she was secretary of State. She has an odd understanding of brilliance. The "reset" gave us a world where Georgia remains illegally occupied, where Poland and the Czech Republic lack missile defenses, where American parents cannot adopt Russian babies, where Russian bombers fly within 50 miles of the Pacific coast, where Ukraine is sundered, where the prospects for ground war in Eastern Europe are high, where Putin says U.S. sanctions against his cronies will take bilateral relations to a "dead end." When I hear comments such as Clinton’s, when I listen to White House press secretary Josh Earnest say, in all seriousness, that his administration has "substantially improved the tranquility of the global community," I feel as though they are lost in the postmodern funhouse of the Kremlin’s "non-linear war," as though they, too, are casualties of Russian Maskirovka, of deception, concealment, propaganda, and disinformation. "Non-linear war is the means through which a geopolitical raider can leverage his relative weakness," writes Peter Pomerantsev. "And this vision appeals to a very broad constituency across the world, to those full of resentment for the West and infused by the sense that the ‘global village’ model is a priori rigged." Russian manipulation of narrative and image, of wishful thinking and gullibility, has been such a success that the Obama administration actually believes it has accomplished something. It hasn't. On the contrary: President Obama has relinquished American standing, neglected America’s responsibilities as the guarantor of international security. The heralds of the "post-American world" devote most of their songs to the wonders of the BRIC economies, the rise of a globally conscious, technologically savvy youth culture, the justice of a humbled America, the importance of institutions and conferences and stakeholders in resolving global conflict through diplomatic means. What they never get around to singing about, in any particular detail, is the day-to-day reality of the post-American world: the headlines one encounters when Vladimir Putin is unrestrained; the numbers of dead and wounded in civil wars fueled by Russian weapons and Russian assistance; the lies and conspiracies and anti-Americanism fueled by Russian information operations; and the unexpected events, the contingencies, the collateral damage of insurgency and strife. No secret why they leave all this out: such dissonant lyrics do not jibe with a placid, comforting melody of exhaustion, war weariness, senescence. Well, there is no getting around it now. "Obama contends with arc of instability unseen since ’70s," says the Wall Street Journal. Militias and rogue generals in Libya, Hamas versus Israel, Hezbollah and Assad and Iran against Sunni rebels and the Caliphate, the prospect of an Iranian bomb, war in Ukraine, withdrawal from Afghanistan, China bullying its neighbors—such is the extent of global disorder today. "It’s 3 a.m. and your children are safe and asleep," Hillary Clinton’s campaign imagined in 2008. "But there’s a phone in the White House and it’s ringing." Things are "happening" in a "dangerous" world. "Who do you want answering the phone?" Today we know the answer: The phone isn’t ringing in the White House. It’s ringing in the Kremlin. And the man answering it is Vladimir Putin.